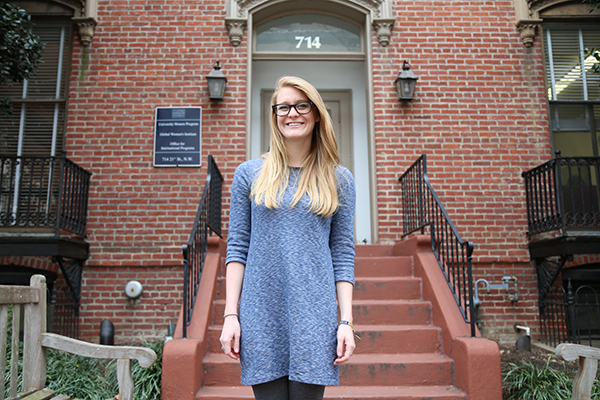 Senior Marguerite Wedeman, who received a prestigious scholarship to study in China next year, said faculty in the University Honors Program have been particularly supportive during her time at GW. Marguerite “Maggie” Wedeman found out she was selected for a prestigious graduate scholarship the day before Thanksgiving, surrounded by her family. The Schwarzman scholarship, which funds a year-long master’s program at Tsinghua University in Beijing for graduate students with geopolitical interests, accepted just 111 students, or 3.7 percent of 3,000 applicants, for its inaugural class this year. About 44 percent of the group are American students. More than half are Chinese students or students from other international backgrounds. The program’s classes will be taught in English, and students will be able to narrow their degree to public policy, economics and business, or international studies. Wedeman said she will enter the program studying the latter, working toward a career in security with a focus on Chinese policy. While traveling to another country for a year may push some students out of their comfort zones, Wedeman said she feels right at home returning to the country that has had a substantial impact on her life. Wedeman said her parents, who together have five degrees from GW collectively, have been key factors in shaping her interests over the years. She attended an international middle school in Nanjing, China while her parents were visiting faculty at the Hopkins-Nanjing Center. Her father is now a political science professor at Georgia State University with an expertise in China, and her mother is the chief academic officer at the Washington Center for Internships and Academic Seminars in D.C.
“I think it’s very unique. A lot of students don’t have the kind of support I do, and I feel very, very lucky. My mom is an academic, and she’s helped students apply for Fulbright and Rhodes [scholarships], so having her mentorship is very special,” she said. She also pointed to the University Honors Program, GW’s Chinese program and several mentors at GW who have helped her during her years as an undergraduate, including Stephen Biddle, a professor of political science and international affairs. David Shambaugh, a professor of political science and international affairs, and the director of GW’s China Policy Program, was another faculty member who played a large role in Wedeman’s academic career. He said that Wedeman’s devoted interest to Chinese and international affairs is what makes her stand out as a Schwarzman scholar. More than anything, Wedeman said she is excited to interact with people who have the same passions and interests she does. Robert Garris, the global director of admissions for Schwarzman Scholars, said that the program will act as a nexus for students with similar interests who hope to forge connections for the future. “We intend for alumni to become a global network, eventually as many as 10,000 Schwarzman Scholars, who through links between peers inside and outside China, help strengthen understanding, peace and prosperity on a global level,” Garris said in an email. He said the first class of scholars possess “determination” and “grit,” characteristics that will help shape the program as it begins to take on its own identity.